The Dominican Republic is a rich land with a deep-seeded culture. Occupying two-thirds of the second largest island in the Caribbean, the Dominican Republic is a representative democracy that has been slowly improving its paradise for hundreds of years. When Christopher Columbus arrived on the island during his first voyage to the New World, he described it as “the most beautiful land that human eyes have ever seen.” Today it is one of the most popular tourism destinations throughout the Caribbean! Known for its great deals, expansive resorts, world-class golf and so much more, the island continues to push the envelope and remain a leader in tourism. Visitors wing their way from all around the world to this breathtaking island, which has so much to offer, including gorgeous beaches, awe-inspiring landscapes, exciting activities, and a rich past. Lovers looking for a romantic and luxurious getaway, families on a budget traveling together, and friends in search of thrills, all leave the island happy and wishing they could stay longer. The Dominican Republic’s greatest attracting points are its people and culture. The Dominican people love to welcome visitors to their piece of paradise and show them how to dance the merengue, surf through the water, or enjoy a real Dominican meal. With centuries of history behind them and an optimistic outlook for future, the Dominican people embrace all of its visitors and turn a beach vacation into a life long experience. Located in the heart of the Caribbean, Dominican Republic is a place where you find a diversity attraction for vacations. There are so many ways to relax in the Caribbean’s second largest country. Whether you are looking for a romantic trip for two with lazy days spent on the golden sandy shores or budget-friendly accommodations with adventure for the whole family, the Dominican Republichas it all. Get active on vacation. The DR’s North Coast boasts the Kiteboarding Capital of the world. In and around Puerto Plata, waves and wind are just right for watersport activities. Also throughout the country you’ll find caving, kayaking, zip lining, hiking, horseback riding and more. Strengthen bonds. The DR is a perfect place to get closer. Spend quality time exploring attractions like Ocean World in Puerto Plata or the National Aquarium in Santo Domingo. Kids of all ages will love the Fun-Fun Cave in Los Haitises National Park while Punta Cana beaches are great relaxing together. Dance the merenque. Merengue is a national passion in the DR. Visitors can dance away their cares in clubs, street parades, festivals or just about anywhere the rapid merengue beats play. Most cities in the DR have merengue festivals with professional orchestras and activities planned throughout the year including the annual festival held in late July or early August in Santo Domingo and a week-long celebration held in Puerto Plata in October each year. DR spa renewal. Enjoy world class spas at upscale resorts throughout the country. Well-suited spa hotels in the DR cater to visitors every desire for rebirth and renewal. Many spas use local customs, herbs and traditions in their treatments to restore wholeness and wellness. in cities like La Vega, Santo Domingo and more allow everyone to participate and enjoy the dancing masked devils, floats and costumed characters. Reconnect with nature. A leader in sustainable tourism, eco-adventures and nature explorations abound. Explore national parks, coastal whale sanctuaries, and reserves. From cascading and canyoning down waterfalls and mountains, to kayaking and fishing in rivers, lakes and bays, the DR is a natural. Get your golf game on. Play any of 25 designer golf courses…and growing, in the DR. Punta Espada Golf Club at Cap Cana, Teeth of the Dog at Casa de Campo, Nick Faldo’s Legacy Course at Roco Ki and Playa Grande are a few of the DR courses that have received honors for their beauty and design. Explore the America’s first city. America’s cultural capital of 2010, Santo Domingo is where Christopher Columbus established the first church, hospital and city, known as the Colonial Zone. Explore the museums and walk the streets that conquistadors strolled in the 15th century. Sun, surf and sand. Relax on one of hundreds of unspoiled DR beaches. The country is surrounded by 800 miles of stunning sandy coastlines with the azure Caribbean Sea on the South Coast and the rich blue Atlantic Ocean on the North Coast. The capital of the Dominican Republic Santo Domingowas the first ‘European’ city built in America. 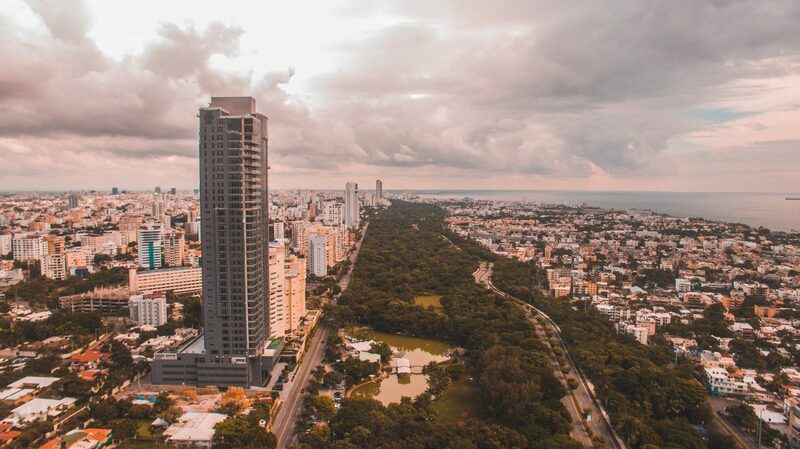 With over 2 million inhabitants Santo Domingo is an energetic and dynamic place. There is much to see and do, whether your focus is cultural events or exiting night-life entertainment. Nearby villages like Juan Dolio and Boca Chico are welcome surprises for those who wish to escape the hustle and bustle of city life. The true Dominican atmosphere can be found here: typical Caribbean shops and restaurants and the lively meringue sound are sure to catch your attention. Puerto Plata is the gate to the northern part of the Dominican Republic. Beaches enclosed by palm trees and an international night-life lure sun seekers from all over the world. There are ample water sport activities on the coastline, a true El Dorado for wind surfers. Be sure to sample the Dominican kitchen, a delicious blend of African, Spanish and Indian influences! Punta Cana, situated on the most eastern point of the Dominican Republic, where the Atlantic Ocean meets the Caribbean Sea boast beautiful, white sandy beaches flanked by a sparkling turquoise sea. Worthwhile attractions are the cathedral of Higuey, the artisan village Altos de Chavon; alternatively many water sports such as para sailing, water skiing and diving can be enjoyed. Dominican Republic has the highest mountains in the Caribbean and different attractions you could enjoy there. Two national Parks and a lots of adventures and ecotourism you could enjoy. Nice weather temperatures, excellents cabins accommodations and friendly people are waiting for you in this beautiful country side of the Dominican Republic. Three national parks are located in the Southwest region of the Dominican Republic: Jaragua National Park, Bahoruco National Park, Isla Cabritos National Park. In Isla Cabritos National Park is located the Enriquillo Lake, biggest in the Caribbean and 3 small island into the lake with different emdemic species lake American Cayman, the Jautia and others. A lots of beaches traveling from Barahona to Pedernales and at the end visit the Las Aguilas bay, increible beautiful beach.